Tues 5/7 – House Judiciary Committee PASSED the GMO Labeling bill 7-4. 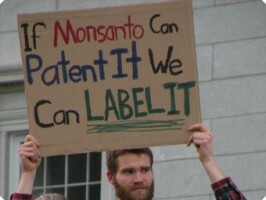 We now expect that the GMO Labeling Bill, H.112, will come to the floor of the House for a vote on Thurs. and Friday of this week. VT could lead the way on giving citizens the right to know and make informed decisions about the food they eat and feed their families. ***ACTION NEEDED: Please call your Representatives (you can look them up here) on WED. and THURS. and ask them to VOTE YES on H.112. *** Vermonters’ health and our environment are priceless. Call the Sergeant-At-Arms office at 828-2228 and leave a very brief message for your Representative with your name, town and phone number. For additional updates, visit the Vermont Right to Know GMOs page. You can also follow the action on the VTRTK Facebook page. Although this bill still has several steps to go, we now expect it to pass before the session ends. The House Ag Cmte has indicated they will concur with changes made by the Senate and this should help speed it on its way. In large measure due to its very narrow scope, this bill will remain “on the wall” in the House Ag Cmte and we expect to make improvements to it next year. This is the latest update. For more background information, read Rural Vermont’s latest alert, and check back here often. You can also visit our Facebook page for additional updates. For more information, contact andrea[at]ruralvermont.org.